A cultivar of Camellia japonica L. The flowers of ‘Candidissima’ are pure white, very double, the petals being regularly arranged, resembling a dahlia. [ICR]. ‘Flower very large, four inches or more in diameter, full, of a very pure white, petals regularly imbricated, and resemble, very much, those of the double white Camellia, and are in number from seventy to seventy-five, broad, a little crenated at the summit, and diminish in width in proportion as they approach towards the centre.-Magnificent.’ [Berlèse Monography p.47/1838]. Berlèse Iconographie vol.I pl.25/1841. It was imported from Japan in 1829 and first grown by Donckelaer in Belgium. [ICR]. [See also T.219]. 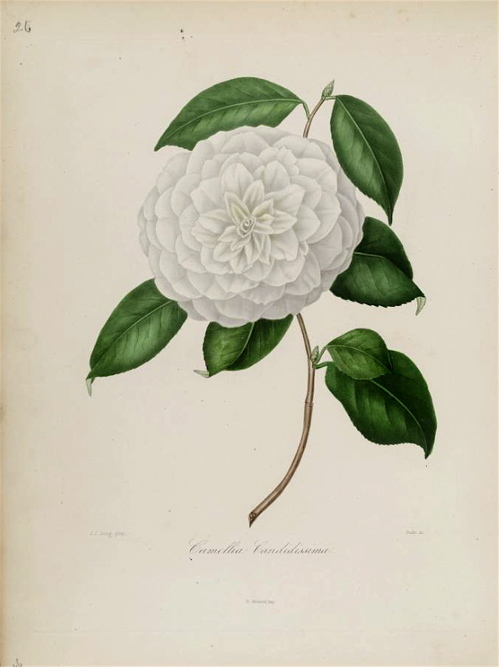 A large sale of Camellias by Loddiges’ nursery, Hackney, included ‘Candidissima’. A potted specimen, ‘12 feet high, one of Messrs. Loddiges’ earliest importations’, sold for 20 pounds. [GC 1848]. Listed in the 1850 and 1857 catalogues [T.205/1850], it was probably obtained from Loddiges’ nursery. It was included among desiderata in a letter dated 16th April 1846. [MP A2933-1, p.147].